Mic Check! Big Oil Gets Fact Checked! Yesterday, Big Oil was hurtin’, and boy does that feel good! 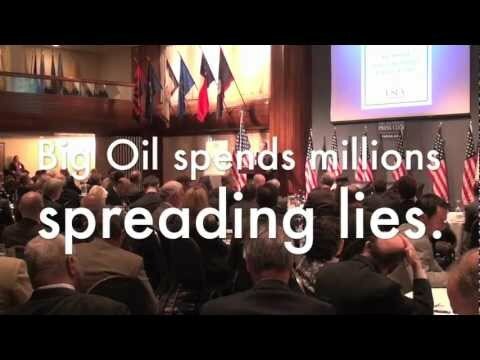 Not only was the Keystone XL pipeline rejected by the Obama Administration, but citizen activists used the Mic Check to "Fact Check" Jack Gerard, the president of the American Petroleum Institute, at one of API’s most important social gatherings, embarrassing Gerard and throwing a wrench in the forum. Jack Gerard (the man who personally threatened Obama over a Keystone XL rejection) addressed the State of the Energy Industry forum. But we already know what state it’s in – a state of corruption, lies, bullying, and playing dirty. API has spewed disinformation about Keystone XL and the fossil fuel industry that has bought off elected officials, brainwashed the public, and catapulted an onslaught of falsified statistics and corrupt back-room deals. This legacy of lies must stop. One of the best ways we are doing this is by outing the liars themselves. We knew we had to disrupt this sickening display of corporate greed and self-congratulation, but instead of mic checking Gerard, we thought we would dish out a hearty serving of truth. So, we Fact Checked him. In this very simple, yet very effective tool, we broadcasted our message of democracy, clean energy, and the 99% to the very villain himself, and all those in attendance. We confronted the most dastardly of liars with the truth about dirty money in politics and dirty energy in our communities, and embarrassed him in front of all the forum guests (including the media). And folks, it was a hell of a lot of fun. My heart was pumping in my throat as I sat mere feet from Gerard in the small, ornate dining room filled with oil lobbyists and executives. We were patiently, painfully waiting for the right moment. And then, Gerard started to list off the impediments to fossil fuel development, claiming that sheer political will was standing in the way of Big Oil putting revenue in the hands of the American people. What a bunch of bald face lies! It was time - I stood up and began our chorus: FACT CHECK! We all stood up. Our voices combined were deafening in that small room. I could see Gerard fuming under his smug grin. We were hurried out by Suits with nervous demeanor, but not before we were able to get a few powerful last words in. This was Big Oil’s crown-jewel forum - they’d been advertising this forum on NPR and even their top PR officials were talking it up online. It was clear they were embarrassed and totally caught off guard. But this will not be the last one Big Oil hears from us. Oh no. We’ll be visiting them again and again, speaking truth to the lies, corruption, and corporate greed of dirty energy, and replacing it with a vision of transparent democracy and a just, clean energy future. So now it’s your turn- your chance to Fact Check dirty energy. Whether it’s on your campus or in your community, in the classroom or in the boardroom, on Wall Street or on Main Street, in the city or in the country, Big Oil, Baron Von Gas, and King Coal deserve to be called out on their fraudulent public image, their cowardly ways of corrupting democracy, and their intolerable oppression of resistance by communities and the 99%. No matter how you communicate it, Fact Check the hell out of dirty energy. Rise to the occasion, organize, and seize these rare opportunities to stick it to the corporate shmucks where they and the whole world can hear you. Stand up to them face to face and exert the ultimate power they’ll NEVER have - the power of the people.